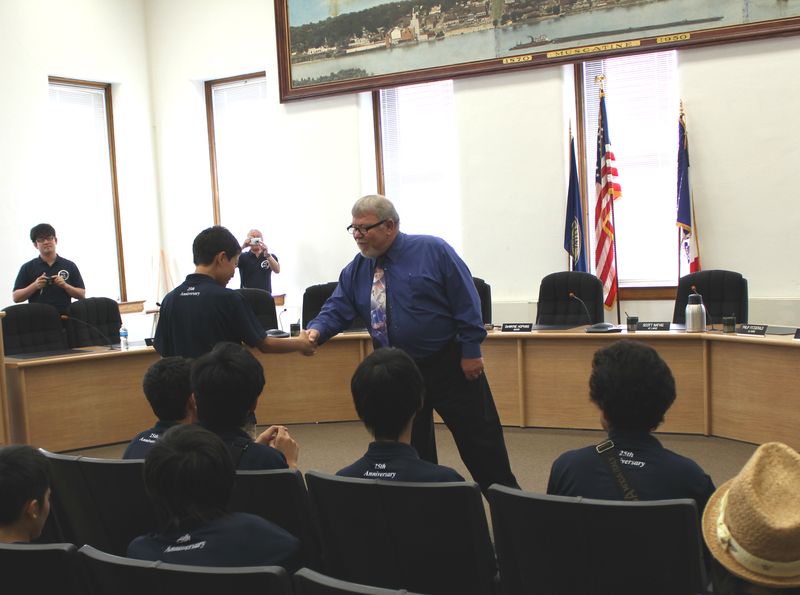 On Thursday, July 30, Mayor Hopkins had the pleasure of giving a tour of City Hall to a group of students and their chaperones from Ichikawa Junior High School in Ichikawamisato, Japan. Ichikawamisato is one of Muscatine’s seven current Sister Cities. Muscatine and Ichikawamisato’s official sister city relationship goes back to 1990, meaning that this year is the 25th anniversary. 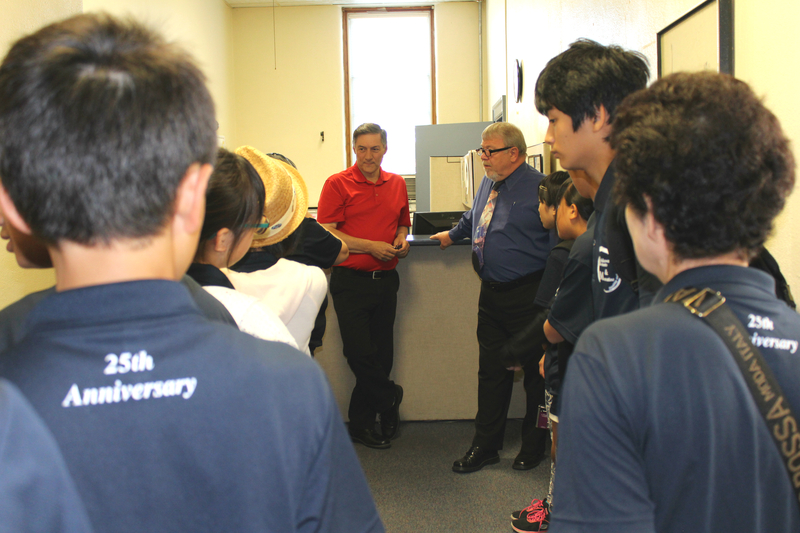 Mayor Hopkins began the tour by telling the students a little bit about what he does as mayor. He showed them his office and then guided them to meet with Finance Director Nancy Lueck and Community Development Director David Gobin. Both Nancy and David gave our guests an overview of their departments and discussed what they do for Muscatine. The students had the opportunity to introduce themselves and ask questions. They were eager to learn more about Muscatine. 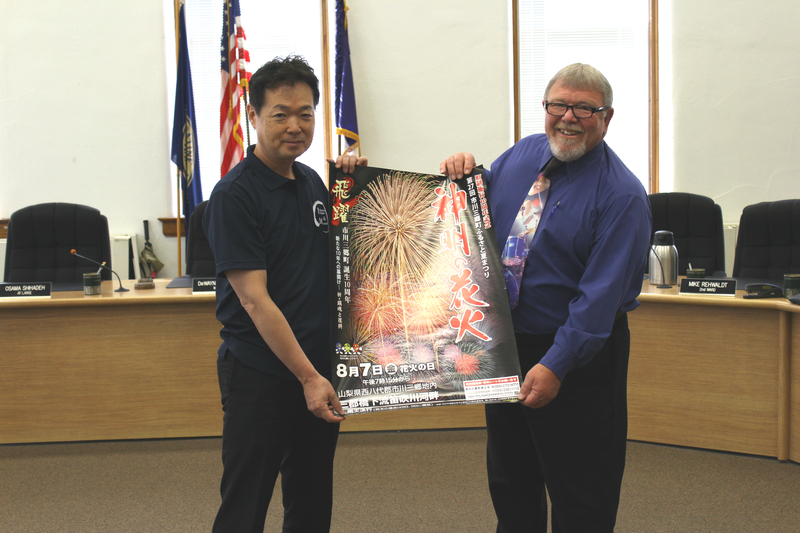 Principal Wataru Watai from Ichikawa Junior High School presented Mayor Hopkins with a poster highlighting the annual fireworks festival in Ichikawamisato. I can tell you from first-hand experience that the fireworks show they put on each year is incredible! Over the years, there have been countless Muscatine students and families involved in the exchanges; each one is able to take from that experience a better understanding of another culture. The relationships that have been built can be long lasting. 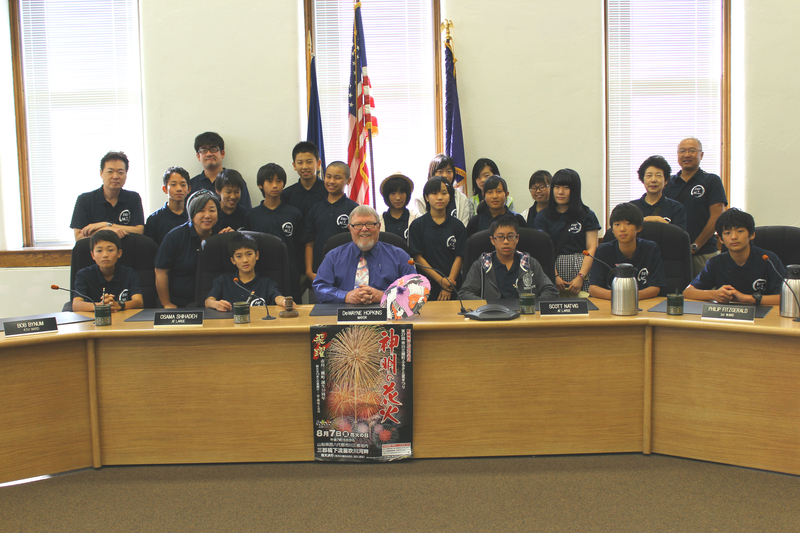 The Ichikawa Junior High School students had a full agenda of touring Muscatine’s sites and getting to know their host families. Their stay was planned and coordinated by Jessica Blanchard, Julie Kundel and the rest of their team. Thank you to all involved in the Japanese visit. 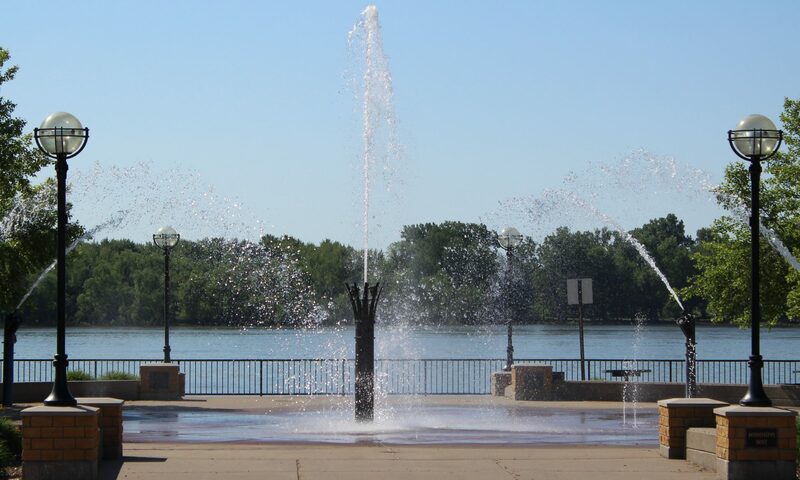 Building relationships in a people-to-people way is why we have sister cities relationships. 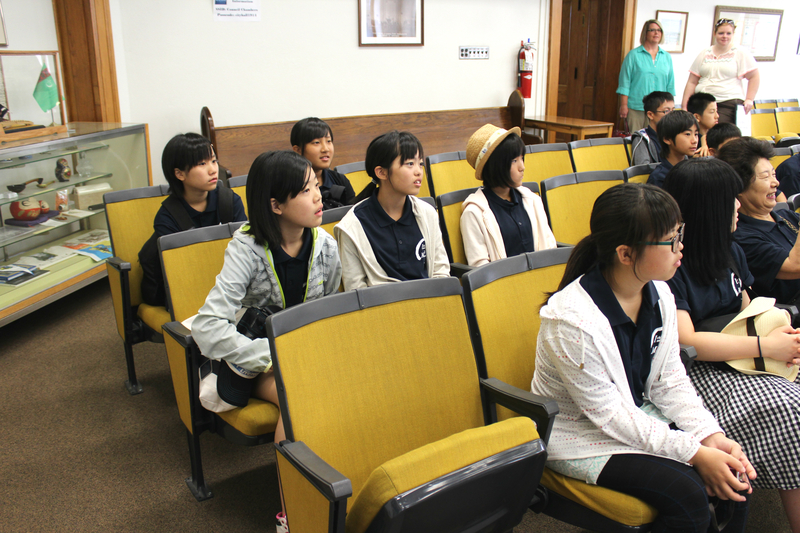 It was wonderful to welcome our Japanese friends to City Hall! Previous PostPrevious What’s Goes On in Public Works? Next PostNext How is the Muscatine Fire Department Staffed?